Grab your family and friends and join us at Chick-fil-A for a benefit night to support Northland Early Education Center! 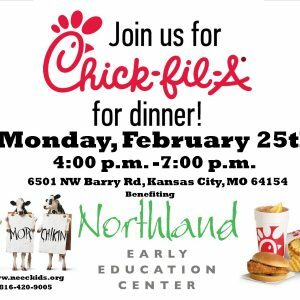 All you need to do is go to Chick-Fil-A on Monday, February 25th between 4 – 7 p.m. and mention Northland Early Education Center. That’s all it takes! 10% of your order will go to support Northland Early Education Center and the services provided by our amazing teachers and therapists. Please help get the word out for this event and share it with your family and friends. Here’s a link to the facebook event page to make sharing even easier! Thanks for being a supporting of Northland Early Education Center. We look forward to seeing everyone there!